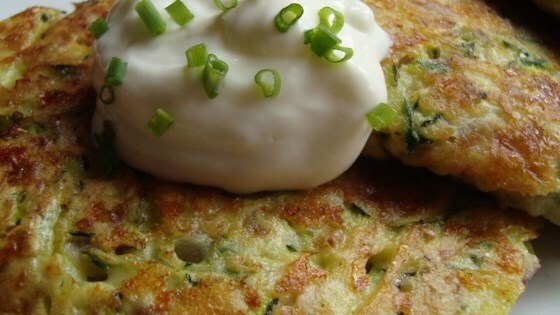 "These cheesy zucchini patties are an excellent way to use up that abundance of zucchini from the garden. Serve with a bit of tomato sauce or sour cream dabbed on top." I added fresh garlic and basil and fried in butter. I don't know exactly what was wrong with it, but it just wasn't that good. It was ok at best. The bf liked it tho. These are delicious! I substituted instant mashed potato flakes for the flour, which I think makes for better taste and consistency!